Follow NOVA producer Linda Garmon's remarkable journey into head trauma—from the complexities of capturing a real-life medical drama on film, to the experience of going on-call with renowned neurosurgeon Dr. Jamshid Ghajar, to the in-depth story of one young boy's fight to live. I like to sit on the left side of the train from Boston to New York, so that when the train gets close to Manhattan, I can watch for my favorite factory sign: "Easyloading Swingline Staplers." I have delighted in this sweeping combination of metal and neon on numerous trips to New York, but it's not until this precise moment, because of the documentary I am considering making, that I realize my personal link to the sign. I am en route from Boston to New York, in hopes of beginning a new project for the PBS science series NOVA. Specifically, I am about to meet a neurosurgeon who helped save the life of a young woman beaten into a coma and nearly to death in New York's Central Park. There are three intriguing aspects of this doctor's approach to treating head injury: It's easy and low-tech, it seems to work—and most hospitals choose not to use it. But whether we proceed with the project is still an open question. There are enormous questions of access: Will hospitals allow us onto wards where the most critically ill are being treated? Will family members allow us to film tragic and intimate moments of their lives? If we do go forward, it will surely involve some unusual production arrangements, so bosses in the home office have requested I keep a running account—the making of "COMA." Here goes. In the ten years I have been making films for WGBH, home to NOVA, I have never been interested in doing a medical documentary. Until now. On the train, I am re-reading an excellent piece in THE NEW YORKER, "Conquering the Coma," by Malcolm Gladwell, which is about the Central Park case. This is what had compelled me to pick up the phone and call Dr. Ghajar to arrange a meeting. On the phone, in our first conversation, I had asked Dr. Ghajar whether head trauma is a big public health problem. I soon learned that it is the number one cause of death and injury in the age group 1 to 44. "If you think about it," Dr. Ghajar had said, "you probably know someone who's had head trauma." Indeed I did. When I was in the second grade, I went flying off of my backyard swing and landed smack on the back of my head—with a rather powerful thud. Dazed and confused, I didn't recognize certain family members and was taken by my frightened parents to a doctor. In the wee hours of the next morning, I awoke in a hospital bed, having no idea what had happened. The best part of the whole incident was my Swingline Stapler. I was confined to my bed for two weeks after leaving the hospital, and my mother buzzed in and out of my room, assuming the roles of doctor, nurse, physical therapist and schoolteacher. She set up a little "office" on a bed tray, to help me keep up with schoolwork; one of the supplies was a stapler—easy-loading, as advertised. I adored it. Now, as I pass the Swingline Stapler factory sign, I think about my own experience with head injury. It was a concussion, not a serious blow. Nonetheless, I would never be able to remember the hours—and even days—leading up to the accident. How could this be? How could the brain go backwards in time and block out what happened before the moment of impact? As the train winds its way into Penn Station, I am minutes away from beginning an unbelievable journey into head trauma—one that will answer the question of my own experience, as well as take me on an emotional adventure that I could not even begin to imagine. The most frequently asked question of documentary producers is how do you choose topics? The answer: We look for good storylines; good, articulate characters; and good visuals. A well-made program should leave the viewers feeling as if they had been side-by-side with the participants, experiencing the actual events with them. To meet this goal for a program on head trauma, it was clear that we couldn't rely on a bunch of laboratory shots and lots of narration. Instead, we needed to capture an unfolding coma case, managed by Dr. Ghajar, from the moment it arrived in the emergency room. We needed to bring to the viewers a case that unfolded right before the cameras. But this presented a host of questions to answer: How could we know when such a case would start to unfold? Where should we post ourselves—and when? How long would it take a typical coma case to unfold, and could the average budget for a NOVA do the story justice? I had walked away from my first meeting in New York on the COMA project with about two thousand truly convincing reasons not to proceed. But there was one undeniable reason to go forward—and that was Jam Ghajar. "The art of medicine—I hate that phrase!" he said in our first meeting. "Doctors use that phrase to mystify the profession and keep it at arm's length from patients." Medicine should be based on the best scientific evidence available, not on expert opinion, he explained. Treatment should include basic, repeatable steps that can be performed in small and big hospitals, rural and city areas. Dr. Ghajar, and a handful of his colleagues around the world, had set out to standardize the treatment of head trauma, which is surprisingly variable and sometimes detrimental. And I had the opportunity to witness the revolution. It was hard to resist. 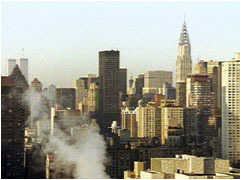 And so now, I find myself back in New York, trying quickly to mobilize production. Dr. Ghajar hands me a beeper. He now is "on call," available to manage severe head trauma cases, 24 hours a day. This is a good opportunity for me to witness the critical steps of a head trauma case; it's an on call rehearsal. This is what I learn: First, once the film crew comes on board, we can't simply trail Dr. Ghajar, or we'll miss the critical first hour or so of the case. In the emergency room, the trauma team first focuses on basic resuscitation—"the abc's," for airway, breathing and circulation—before it can assess the extent of head injury. Then, the patient is taken for a CT scan, a special x-ray, of the head, the first inside look of what's happening inside the head. These are all-important steps—but they occur before the neurosurgeon comes onto the scene. Instead of following Dr. Ghajar as he is called onto a case, we would need to camp out in the e.r. 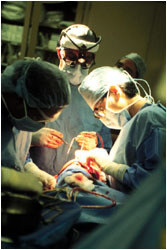 to begin covering a case before the neurosurgeon would even know about it. But there's another complicating factor—he could be called onto cases at one of two hospitals—Jamaica Hospital in Queens, and New York Hospital in Manhattan, separated by a 20 to 40-minute drive, depending on traffic. This would be no problem if we could hire two film crews, camping out at each hospital, waiting for a case. But a quick back-of-the envelope calculation gave me the stark budget choice: We could afford two film crews if we went on-call for just one 10-day period of time; but it was entirely possible there would be no severe head trauma cases during this period. Alternatively, we could staff up with one film crew and go on call two different 10-day periods; but it was entirely possible that with just one crew, camped out at one hospital, we could miss a case unfolding at the other hospital. As I am mulling over the best strategy for filming, Dr. Ghajar is paged by Jamaica Hospital to treat a construction worker who had fallen off a ladder. 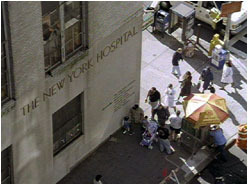 At New York Hospital, he checks in on a young boy, who had been riding his bicycle and had been hit by a car. Both patients went into a coma after the accidents. In both cases, when Dr. Ghajar was called, he inserted a tube into the center of the patient's brain to drain fluid to relieve pressure. The first few days of these cases is life and death, as the medical team goes through a tense period of monitoring and intervention to keep the brain from suffering irreversible damage as the brain swells in response to the violent trauma. Watching Dr. Ghajar's patients at various stages in their recovery is compelling. It reaffirms my commitment to documenting an unfolding case from the moment it arrives in the e.r. It's just about four days before we are due to staff up and start production on COMA. I had initially decided to position the crew at Jamaica Hospital, where Dr. Ghajar receives more cases. But I'm shifting strategy at the last minute. What if we can cover both Jamaica and New York Hospitals by splitting up one crew? What if we have two skinny crews, rather than two full crews? The primary cameraperson, Tom Hurwitz, could be stationed with the primary sound person, Peter Miller, at Jamaica Hospital—the likelier place that a case will begin. But the assistant cameraperson, Jeffrey Victor, who also can serve as a second cameraperson, can be stationed with another sound person and myself at New York Hospital. If one or the other team gets beeped onto a case, the two teams can come together. The trick now is to see whether team members will buy into this new plan. They would have good reason to be wary. The new scheme more than doubles each person's workload and responsibilities. If we thin our resources to camp out at two locations, each team member will have responsibility to be his or her own producer, director, researcher, fixer, technician, assistant and so on. I bang out a letter to the crew members, outlining the new plan. With just days to go, it's essential that I get their support. Photos: (1,3) NOVA/WGBH Educational Foundation; (2) Aaron Strong.